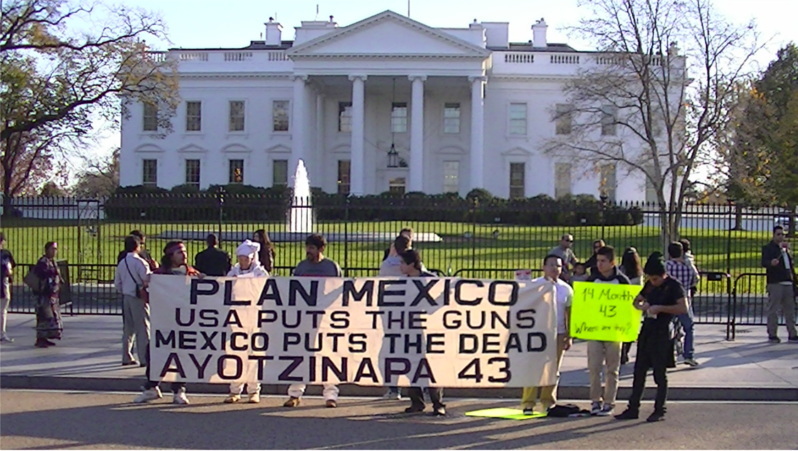 On the 26th of November, activists showed up in front of the White House to remember the Ayotzinapa 43, teaching students who were pulled off their bus by Mexican police and murdered by still-unknown killers a little over a year ago. The Mexican government claims cartel gunmen did the killing, but even if true that still raises the question of why the police would turn a anyone over to drug cartels. Those who escaped the initial battle and survived reported that police opened fire on the busses to stop them. 43 of the students were forced into police vehicles and were never seen again. One escapee was found at the scene tortured to death. One report claims 6 were killed and 26 wounded in the initial ambush. The Mexican government blames cartel gunmen and a corrupt local mayor for the murders. Many say there is more to this story, much more to it. Certainly the United States has been pumping money and guns into "Plan Mexico" which can only be described as a counterinsurgency campaign aimed as much at the rebellious, Indigenous-dominated southern Mexican states as at any drug cartel. Plan Mexico is clearly modelled on the disasterous Plan Colombia.